After developing land, 4000 old tires overlay the area. 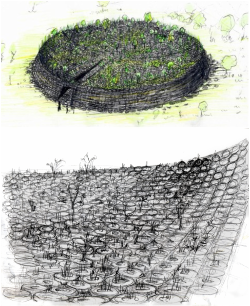 Though the ground is covered with the black tire completely, through the holes of the tires plants and trees will grow and the green will flourish out of the black. Holes of the tires breathe and will be reborn to be a new existence like skin that connects the sky and the ground. The number of tires disposed in Japan amounts to 1,000,000,000 per year. 40% of them are burnt as energy and 30% is recycled as a reusable resource.